This book will renew your passion for your mission and organization, and help you make a bigger difference in the world. JOAN GARRY began her career as part of the management team that launched MTV. After a successful eight-year tenure, she became an executive at Showtime Networks. In 1997, Garry left corporate America and was named the executive director of GLAAD, one of the largest organizations working for LGBT equality. Since leaving GLAAD, Garry has worked as a consultant for hundreds of nonprofits, teaching them, with wisdom, joy, and humor, the keys to effective nonprofit leadership. 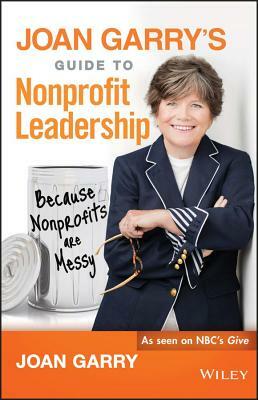 She is a regular panelist on NBC's nonprofit reality show Give. Garry is also the founder of The Nonprofit Leadership Lab; an instructor at the Annenberg School for Communications at the University of Pennsylvania, where she teaches nonprofit media strategy; and a sought-after speaker on nonprofit leadership. She blogs regularly at the popular website www.joangarry.com and hosts one of the top nonprofit podcasts on iTunes, Nonprofits Are Messy. Garry lives in New Jersey with her wife of 34 years and their three grown children.